Oh yes, you read correctly. It's an adapted recipe for Kifli, this Hungarian cream cheese cookie. 1 Cup of Butter, plus another half a stick to melt. While that's going on, go ahead and heat the oven to 350 degrees Fahrenheit, and smash up the Graham Crackers into a relatively fine powder, and put it on a plate. Before you go to roll out the dough, melt the butter and pour it onto a plate (one that's got a raised edge, or you could use a bowl, but the plate was easier for me). Roll out the dough and out circles using a very small cutter (1 inch? 1.5 inches?). 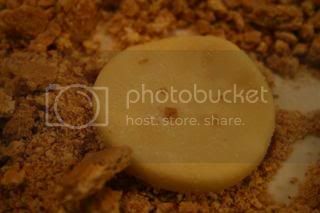 dip the bottom in the melted butter, then press the buttered side into the graham crackers. 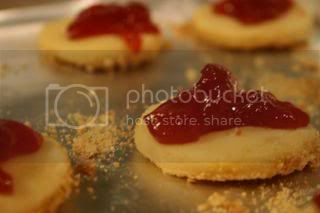 once the whole pan is full of cookies, add a tablespoon or two of jam to the top of each cookie. 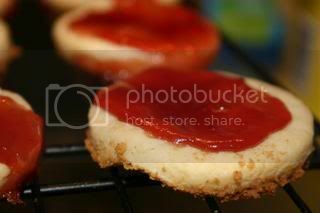 (the thicker the cookie, the more jam you should add). Bake for 10 minutes, or until you can see the edges brown slightly. BE VERY CAREFUL taking these off of the sheet. The hot jam can and will burn you, so watch out! The cookies themselves should be soft, with a nice crunch from the butter/cracker crust. Enjoy! 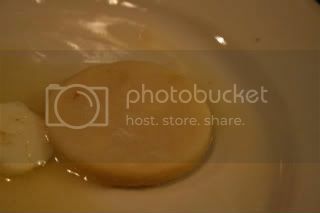 And for fun, here are the pictures from our first attempt! You should post the hilarious pictures of the first time we did this. Saw the link on Psy... going to bookmark your blog now. These are amazing! I'm definitely going to attempt making these when I go home. 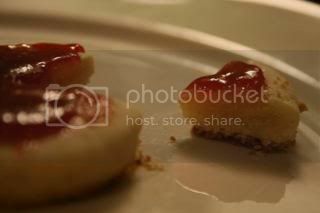 Is the texture of the cookies at all similiar to that of actual cheesecake, or is more cakey? It's kind of like a very very soft sugar cookie. I've decided I'm going to attempt this and your Mini Pumpkin Cheesecake recipe for Thanksgiving. Only with this one I'm going to leave the jam off and hope that it turns out well anyway.